Driving north up U.S. Highway 93 into Eureka, Montana, it’s easy to understand why this area has been dubbed Big Sky Country. The blue, cloudless horizon stretches all the way from the Kootenai National Forest to the Canadian Rockies, framing some of the most beautiful landscapes in North America. On this same route, it’s also easy to see why Montanans have earned a reputation as a fiercely independent group. For the 50-or-so mile stretch of road between the quaint resort town of Whitefish to Eureka, you won’t pass much in the way of a Starbucks or McDonald’s. You will see plenty of deer meandering along the road’s edge, cedar-clad fishing cabins and geared-up travelers seeking rugged adventure alongside the friendly, rustic locals. 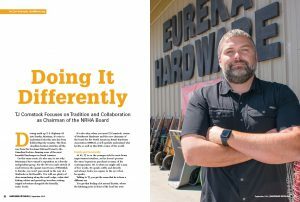 It’s also why, when you meet TJ Comstock, owner of Northwest Hardware and the new chairman of the board for the North American Retail Hardware Association (NRHA), you’ll quickly understand why he fits so well in this little corner of the world. At 41, TJ is on the younger side for most home improvement retailers, yet he doesn’t possess the same loquacious penchant as many of his contemporaries. He is what you might call a man of few words. He speaks softly and directly and always looks you square in the eye when he speaks. Talking to TJ, you get the sense that he is from a different era. You get that feeling a lot around Eureka, where the hitching posts in front of the local bar were only removed a couple decades ago, and small, independent businesses seem to be the rule, not the exception. TJ Comstock’s parents owned and operated a grocery store in Eureka, Montana, before buying the hardware store next door. TJ served as manager of the hardware business as a teenager, which was his first introduction to hardware. TJ grew up in this idyllic, rugged landscape, spending his afternoons fishing in the cold streams or exploring dusty mountain trails in a four-wheeler. He also grew up in the family business. Both of these experiences helped form his current views on the industry, family and community. TJ’s parents, Jan and Karen, moved to Eureka in the early 1970s to buy and run the local grocery store. Eventually, that business blossomed into other ventures, including trucking, real estate and cattle. And like in most family businesses, TJ played a role in operations from an early age. Early on, TJ’s father saw an opportunity to expand his retail holdings when the hardware store adjacent to his grocery became available. After acquiring the small operation, TJ says the family ran it as if it were just another department within the grocery store. As soon as TJ was able to get the hardware side back on firmer footing, he took on a new challenge in the family business: becoming operations manager for the entire grocery, hardware, trucking and cattle interests. “Then, as every good story begins, I met a woman,” he jokes. Just when he began taking on more responsibilities within the family business, TJ met a local woman named Kami, who he would eventually marry. For someone not prone to any hints of sentimentality, TJ clearly softens a bit when he gets to this subject and reflects on his decision to leave the family business to be closer to Kami, who was attending college in Missoula. With this goal in mind, the young TJ barreled into academia and managed to convince the dean to let him “just take a couple classes” without any of the more traditional prerequisite testing or admitting procedures. 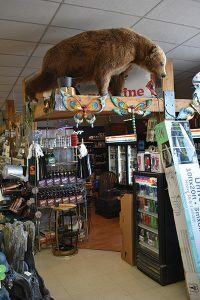 Icons of typical Montana living are seen throughout TJ’s home improvement businesses, such as wildlife and outdoor living necessities. This newfound love for education prompted TJ to begin taking even more classes in finance and economics. He completed his degree in just over three years and picked up a new set of skills that he was eager to apply to the real world. Upon graduation, this meant taking a job in finance for a large corporation. However, sitting behind a desk and punching a clock wasn’t suited for someone who grew up under those big skies of Eureka. “I clearly remember sitting at my desk and just watching the clock, waiting for lunch to come so I could get up and do something different. I had never been that guy. But there I was,” he says. He watched the clock for nine months. That was enough. TJ’s independent spirit couldn’t be confined in an office, and he made the decision to take his fate into his own hands and buy his own store. Knowing that the corporate world was not for him, TJ found a local hardware store north of Missoula that was up for sale. He reached out to the supplier to help put together a deal. After negotiating for several months, the deal fell through. “I learned a lot during the negotiations, but it was disappointing that it didn’t work out,” he says. Fortunately, through the contacts he had made at the supplier, he found another store in Billings for sale. After he expressed an interest in this opportunity, things moved quickly. Fiercely independent and armed with a formal financial education and a family history in retail, TJ now found himself as a first-time storeowner of a retail hardware operation. There was just one problem. He didn’t really know much about hardware. “Honestly, the only time that I had really spent in a hardware store was for my own projects and the very short time I spent as a manager with my family’s operation. 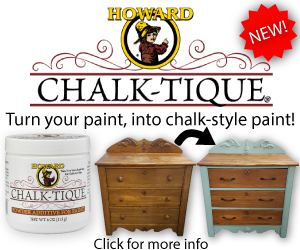 The first thing I had to work on was my product knowledge,” he says. Fortunately for TJ, he had inherited a strong crew from the past owner of the business, including Vern Brost, a longtime assistant manager with the business who had a depth of knowledge across the hardware spectrum. While he was learning product knowledge under Brost, TJ was also fighting to earn respect from the rest of the team, most of whom were nearly twice his age. 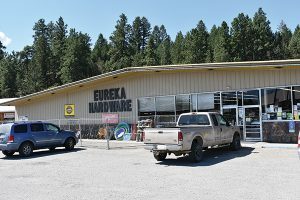 Eureka Hardware started as an extension of the Comstock family’s grocery business, and it has remained that way since TJ bought the store from his father several years ago. Jodi McCully, TJ’s sister (left), manages daily operations for the business. 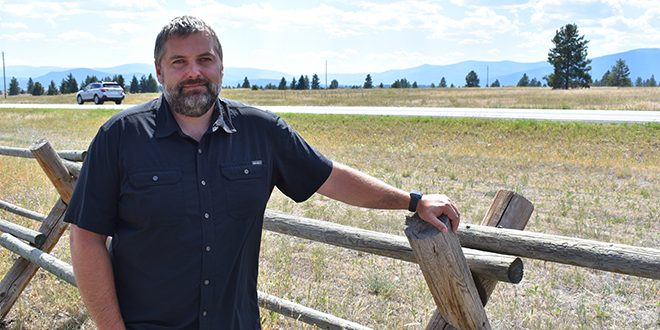 With continued support from his seasoned team, TJ managed to squeeze some stability, then growth, out of the Billings location. Just over a year later, however, he was presented with another opportunity to grow. 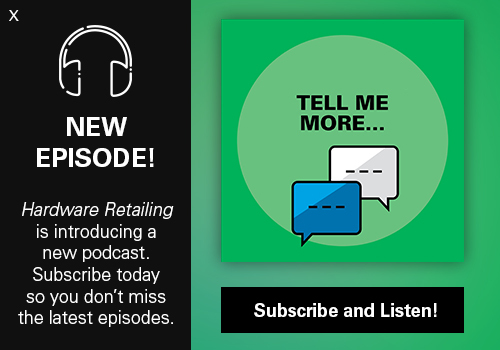 While it might seem overly ambitious to buy a second store just when you are starting to get your arms around running your first, being timid wasn’t necessarily wired into TJ’s DNA. Also, it was never TJ’s vision that he would actually manage multiple stores. In fact, his plan was more geared around running a hardware operation fueled by growth. Find an opportunity, find the right people, find the next opportunity, grow the operation. This was TJ’s strategy. 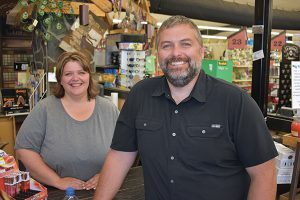 Based on this strategy, TJ and Kami opened another store in Roundup, Montana, a year after buying the family store in Eureka. This operation was their first ground-up build and proved to be another learning experience for the budding entrepreneurs. Over the next several years, TJ focused on dialing in operations at these three stores. Then in 2014, an opportunity to open a second location in Billings presented itself. The existing Billings store had a thriving small engine repair business. Continuing to grow this segment of the operation would require more space. After this spate of opportunistic growth, TJ says he is now focused on making sure the operation is running well and positioning the business for further growth. 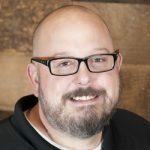 He admits that a major part of this strategy is having the right personnel in place, and he is quick to credit his team, which includes his sister Jodi, who runs the Eureka store, for all of the support they give the operation. 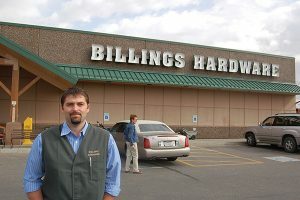 Billings Hardware was TJ’s first foray into hardware as an adult. He purchased the business in 2006, and as a result of his investment in the operation, which included expanding the store, he earned the NRHA Young Retailer of the Year award in 2010. While there is a distinctly independent sensibility that pervades the Montana towns where TJ grew up, there is also a strong sense of community. These are the kinds of towns where, if your car breaks down, you might not be able to call AAA, but a neighbor is sure to come along to help you out. This willingness to help out a neighbor, support another small business or lend a hand to someone in need is also part of TJ’s fabric and is ultimately what led him to get involved with his industry’s association. TJ was first introduced to NRHA in 2010, when he was nominated for and won the association’s Young Retailer of the Year Award. He admits that receiving the award, having to get up on stage and ultimately make a speech pushed the boundaries of his normally introverted comfort zone. Despite pushing these boundaries, however, winning the award exposed him to an entirely new community of peers. About a year after winning the award, TJ was approached by former board chairman Tom Ruedisueli, who asked if he would consider joining the NRHA board of directors. 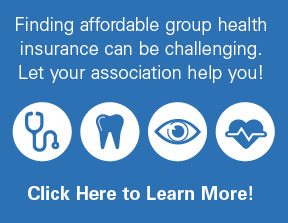 “I did some digging and discovered NRHA was an industry organization that I really didn’t even know existed. Once I knew more about it, I saw it as an opportunity to help influence the industry and also learn from others,” TJ says. During his time on the board, TJ has sought to learn even more about how other successful independents run their operations. He has participated in NRHA-sponsored events such as the State of Independents Conference, Retailers’ Choice Awards and CEO Roundtable. He has also utilized NRHA programs like the Retail Management Certification Program to help further educate his staff to better lead the operation. It’s this kind of attitude that has earned TJ the respect of fellow board members who share his vision of an independent segment of the industry made stronger through cooperation with one another. 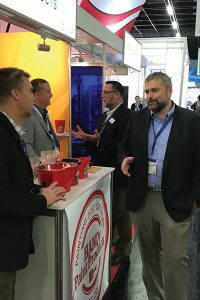 As chairman of the NRHA board, TJ will be the retailer face and voice of the association, connecting with channel partners throughout the industry. NRHA immediate past chairman Megan Menzer feels TJ’s insights and enthusiasm will be an asset to the association. NRHA president and CEO Bob Cutter agrees with Busscher and Menzer. It is this same kind of honest input that TJ hopes will not only position his business for further growth and success, but that is also sorely needed if independents are going to be competitive.